Ask the Expert… How do I Cleanup Mold in my Home? Short and simple answer: Don’t. Don’t try and Cleanup Mold in your home without consulting a Restoration Expert from ARS Cleanup. You could make the situation worse. By trying to Cleanup Mold yourself, you could inadvertently be causing further damage. Almost every household cleaner contains a certain amount of water in the ingredients and water is a food source for mold. Don’t feed the mold. You could be using the wrong chemicals or solutions. Using improper chemicals or cleaning solutions can cause mold to react and send more spores all over your home. If you use a chemical improperly, you could be subjecting everyone in your household to harmful fumes. You could cause further damage to your home. The chemicals or solutions you use could also cause damage to your paint, drywall, and other surfaces you might be applying it to. As a result of disturbing the mold, spores are sent into the air where they can be breathed in and can cause respiratory illness or distress. Proper resperatory protection while cleaning mold is a must. A dust mask is not adequate protection against mold spores. Certified Mold Remediation Technicians at ARS are trained to look for Mold in the most unsuspecting locations. Even though you might have cleaned up all the visible Mold growth, it’s extremely easy to miss mold hiding behind baseboard or underneath an appliance. Look closely, you’ll see Mold hiding behind where the baseboard was attached! 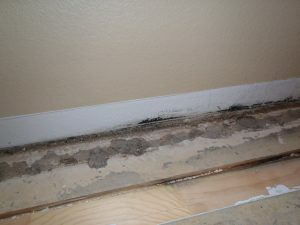 Keep in mind, most of the articles or tips on the Internet are not given by Mold Remediation Experts. Also, janitorial companies, cleaning services, or a handyman might not be certified to remediate mold. Consequently, they could also make mold growth in your home worse. 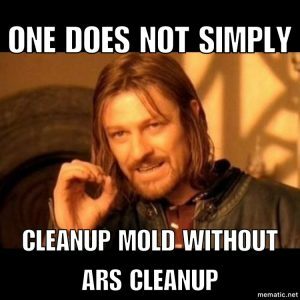 Before attempting to Cleanup Mold on your own, give ARS a call to see if you qualify for a free consultation!